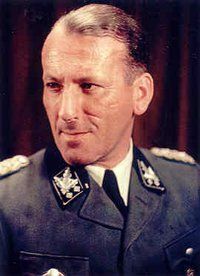 Citation: C N Trueman "Ernst Kaltenbrunner"
Ernst Kaltenbrunner was the most senior member of the SS captured by the Allies at the end of World War Two. Involved in the Holocaust, Kaltenbrunner stood trial at Nuremberg and was sentenced to death for his crimes. Kaltenbrunner joined the Austrian Nazi Party in 1932. He was a devoted follower of Adolf Hitler and within Austria he worked closely with Arthur Seyss-Inquart and Adolf Eichmann. By 1933, he was a district speaker and legal councellor to the SS in Austria. Kaltenbrunner gained a reputation for effective leadership and he became head of the Austrian Nazi Party. He was also appointed head of SS Division VIII.Ernst Kaltenbrunner was born in Ried-im-Innkreis in Austria on October 4th, 1903. His family moved to Linz and he went to the State Real Gymnasium. Kaltenbrunner studied law at Graz University and by 1928 he was working in Linz. However, in January 1934, he was jailed for six months. He had been charged with high treason but after months of investigation, this charge was thrown out. But he was found guilty of conspiracy and was sent to prison. When he was released Kaltenbrunner was suspended from practicing law as it was felt that his very public activities involving the Nazi Party and the SS brought such the profession into disrepute. After Anschluss in 1938, Kaltenbrunner was rewarded for his part in the success of this by being appointed State Secretary for Security Matters in March 1938. From 1938 to 1943, Kaltenbrunner gained more and more power as a result of promotions. In 1941, he was appointed Major-General of the Police. However, his power base was primarily in Vienna and not Berlin. This all changed with the death of Reinhard Heydrich. In June 1942, Heydrich was assassinated in Prague. In January 1943, Kaltenbrunner replaced him as Chief of the Security Police and the SD. Hitler rewarded Kaltenbrunner for his work with the Knight’s Cross of the War Merit, Cross with Swords, a rare award and a sign of Hitler’s opinion of Kaltenbrunner. Kaltenbrunner was involved with the organisation behind the murder of Jews and others in the death camps. In every sense, he simply carried on the work of Heydrich. Kaltenbrunner also gave orders that captured Allied POW’s should be shot. Kaltenbrunner’s power greatly increased after the July Bomb Plot of 1944. Hitler placed great trust in Kaltenbrunner who had direct access to him – regardless of any obstacles put in his way by Martin Bormann.